Begin by prepping your veggies and thawing your fish (if it’s frozen). Mince about 1 tablespoon each of ginger and garlic. Mince it pretty finely. Chop the bell pepper as finely as you can and slice up the scallions finely. Add 1/2 teaspoon of the sesame oil to a non-stick pan over medium heat and add the ginger and garlic. Cook for 1 minute. Add the peppers and scallions and cook for another minute. Add the 1 tsp curry powder, 2 tsp red curry paste and 1/2 tsp ground cumin and cook for another minute, stirring constantly. Add the soy sauce, 1 tbsp. brown sugar and 2 tsp fish sauce and stir to combine. Shake the whole can of coconut milk and pour it in. Stir well to combine and drop the temperature to med/low. You want the mixture to get to the point where it’s bubbling in the centre, but not overtly boiling. Give it a stir every 5 minutes or so while you deal with the rice and fish. This sauce should cook for about 20 minutes and will darken in colour substantially. Just keep an eye on it. If you’re serving this with rice, you should start that now. Dry the fish as best as you can with paper towels as we’re going to try to sear it in a cast iron skillet. If it’s wet, it’ll never sear. Season both sides with a little salt and pepper. Fire up a cast iron skillet on the highest heat you have (or another stainless/aluminium pan – DON’T use non-stick at high temperatures by the way). Let it get up to temp and add a thin layer of oil to cover the bottom. Once the oil starts to shimmer and move, it’s hot enough to sear. Lay the fish in the pan carefully and don’t touch it. Drizzle a few drops of sesame oil onto the face of the fish while it sears. You’ll see the edges of the fish start to cook first. We’re kind of aiming at 70/30% before the flip. 70% of the fish will be cooked through on this side before turning it over. It’ll take maybe 5-7 minutes but this depends on the fish, your burner, the oil, etc. Just poke at the under-side of the fish after 5 minutes and once it starts to release from the pan, it’s ready. Flip the fish carefully, drop the heat to medium and cook on the other side for 2-3 minutes. It should flake easily and not be mushy. Your sauce should be nearly done by now. Notice how it has darkened. Add in some fresh cilantro at the last minute and stir to combine. 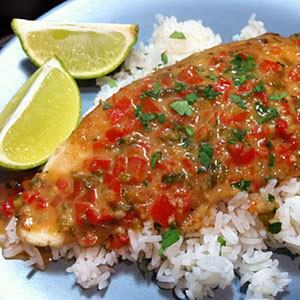 Serve the fish over rice and spoon the sauce over top. Serve with lime wedges.